Choreographer-turned-filmmaker Farah Khan says she is happy for Ekta Kapoor, who has become a mother of a baby boy and says that having children is a life-changing event. Farah spoke to the media on the sidelines of Ekta’s epic ‘baby naming’ ceremony that was graced by many in Bollywood on Monday here. “I am really very happy for both, Tusshar and Ekta. It is my kids’ birthdays as well, so I am here to give blessings,” said the 54-year-old Bollywood personality, who is married to Shirish Kunder and has triplet Czar, Diva, and Anya. “It is a life changing event to have children and only when you have kids then only you realize what is important in life,” she added. Jeetendra, his wife Shobha Kapoor, Tusshar and son Laksshya were there, apart from close friend Karan Johar, who came along with his mother Hiroo Johar. Karan too, had twins – Roohi and Yash – also via surrogacy in 2017. 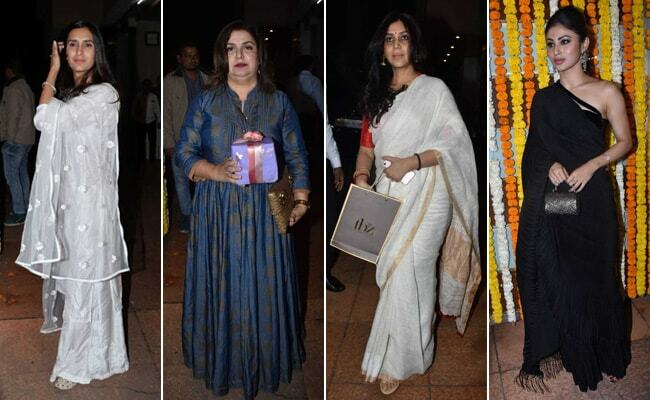 Union Minister Smriti Irani, Swara Bhaskar, Shamita Shetty, Huma Qureshi, Mona Singh, Rakshanda Khan, Rhea Kapoor, Shabir Ahluwalia with wife Kanchi Kaul, Anita Hassanandani and husband Rohit, Surbhi Jyoti and many more were seen at the venue.